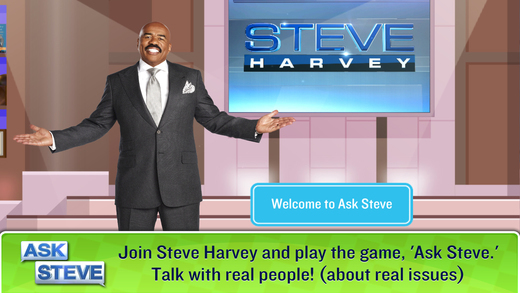 The Official Licensed App for "Steve Harvey" Nationally Syndicated Daytime Show Available Now! Ask SteveTM is available now for free on Google Play Store and the iOS version is expected to be available soon. Let’s go to the audience; it’s time for Ask SteveTM! Inspired by the fan-favorite segment of the daytime show, We Play Media has taken the classic “What would you do?” question and gamified it into a social sharing platform. 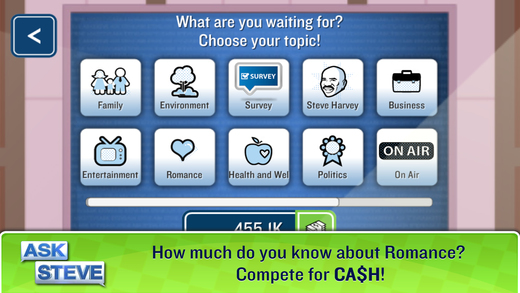 Players can compare their answers to questions on everyday dilemmas that fall under various categories including friendship, family, romance, and business. Select a trending topic and jump right in with issues that test your moral compass, pull at your heartstrings and tickle your funny bone. Test your knowledge of pop culture, entertainment, business and more! Each predicament will ask that all-important question: "What would you do?" Every question has three answers. Choose the most popular answer and Bam! Win Big Baller Shot Caller In-App CA$H. My ex-husband and I have two kids. We have both remarried, and all spouses get along as do the six children from the marriages. I think we should raise the kids as one family unit. My current and my ex-husband think I am nuts. What are your thoughts? A. No, you are not nuts, it's healthy and necessary to raise the kids as one family unit. B. Yes, you are nuts. You can only control your household. C. Because you all get along, you should not upset the apple-cart let sleeping dogs lie. Why do celebrities choose crazy baby names? A. It's a competition between celebrities to see who can out strange name their child. B. No name given to a baby is crazy. C. Celebrities are entertainers and naming a baby Rocket is another form of entertainment. “It is an exciting time to be a mobile media and development publishing company,” said Ask SteveTM game app, Sharen King. “We are thrilled to work with Endemol Shine North America and the Steve Harvey brand to develop another avenue for leveraging the show fan base."